Let’s see how it works with the free open-source help desk system ((OTRS)) Community Edition. Since the best way to wrap your head around it is by providing an example, let’s say we run a hypothetical company that cares about their customers, uses ((OTRS)) Community Edition and wants to use Nicereply to get customer feedback on its agents. Our company is called Fat Cat, ltd.
We have two user agents, John Garfield and Betty Kitty. We’ve already signed up for Nicereply and created accounts for both our agents. First we have to edit the user IDs of our agents to match those of our ((OTRS)) Community Edition. We do this by copying the Last name of agent from ((OTRS)) Community Edition (admin -> username) to field ‘Username’ at Nicereply profile in Staff -> Edit Person. We repeat this with Betty Kitty. Next, we have to activate the Ticket Link feature (CSAT > Rating pages > Ticket link) to link every rating to a ticket on the ((OTRS)) Community Edition. 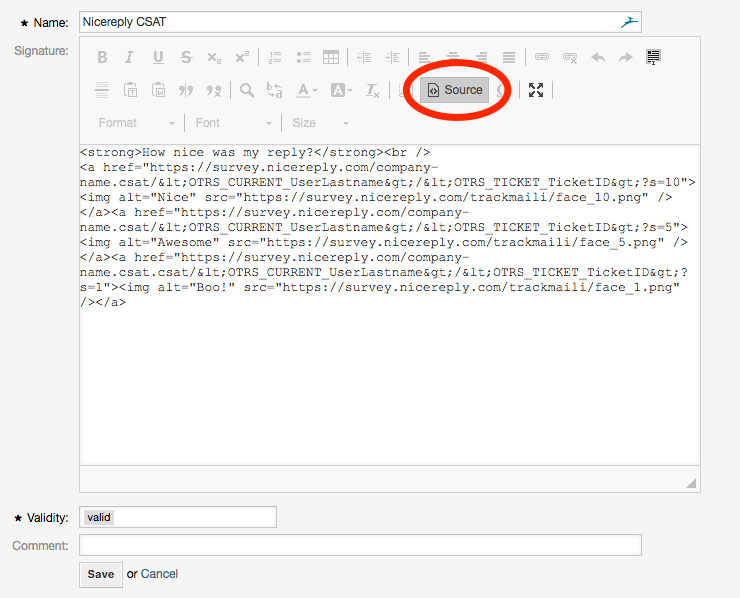 We put our ((OTRS)) Community Edition ticket URL into “Ticket system URL” field, in this case https://yourdomain.com/otrs/index.pl?Action=AgentTicketZoom&TicketID=>. Now comes the ((OTRS)) Community Edition part. There are many ways to get the rating link to appear in your support emails. We’ll do it by editing the Signatures (Admin->Signatures). Lucky for us, ((OTRS)) Community Edition provides a nice way to add variables or signatures. This means it’s quite easy for us to construct a proper, working rating link. 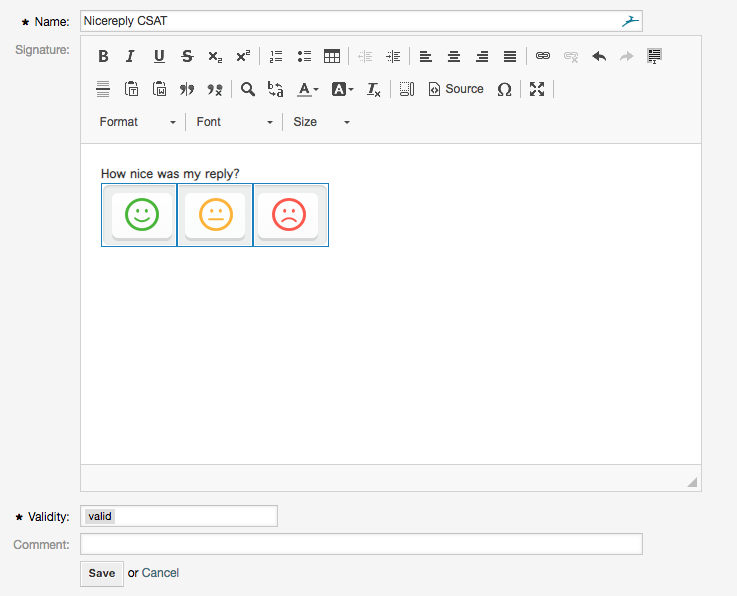 The only thing we have to do is add an HTML code from your Nicereply account to the body of responses or signatures. We have now successfully connected Nicereply and ((OTRS)) Community Edition. 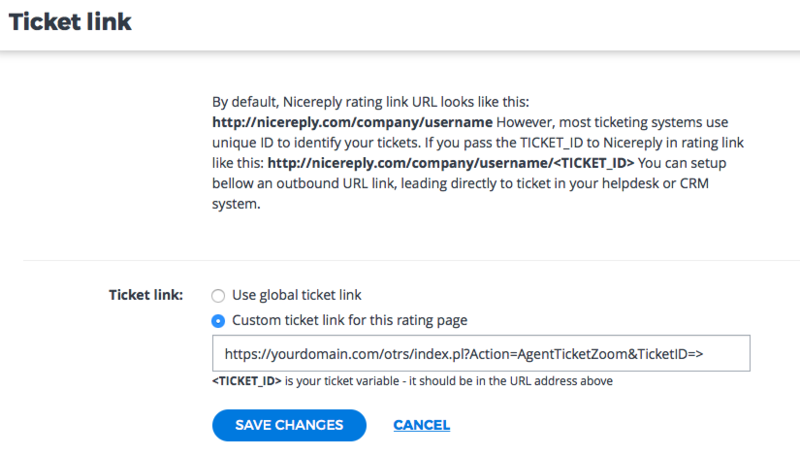 Your customers will now be able to rate your help desk emails and you’ll have the ability to easily evaluate the performance of your help desk team AND see which ticket each rating relates to.